Property Solutions, the creators of the Barracks, SW1 and James Street have unveiled their newest addition soon to join Nundah’s village precinct. Known as ‘Circa Dos‘, the tower is the second residential stage of the Circa Village redevelopment which includes 2.5 hectares of plaza redevelopment encompassing retail, cafes, bars, restaurants, the Energex anchored 5 star Green Star CT1 tower and a 2,000 square metre Go Health club. NUNDAH NOW from Circa Nundah on Vimeo. The massive new retail plaza and Energex commercial tower is scheduled to be completed by the end of the year, while the first residential stage is to be completed by May 2013. Following the success of the first residential stage, which has so far sold over 80% of apartments, Property Solutions is bringing the second release stage forward. Circa Dos has 102 one and two bedroom apartments across 9 levels and is launching on August 25. Prices start from $345,000 for a one bedroom apartment while two bedroom apartments are priced from $450,000. CBRE Residential Projects last week launched its ‘NRAS Cash Flow Positive‘ campaign which promotes the 50 NRAS allocated units in Circa Dos. 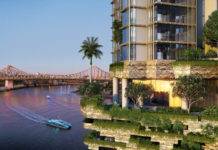 CBRE Residential Projects Managing Director Paul Barratt said that NRAS investment is now starting to become well known in Brisbane, as people understand the benefits of owning an NRAS investment property. CBRE’s Paul Barratt said that Circa Nundah will transform Nundah Village into another sophisticated urban village that will easily rival The Barracks and James Street. “The scale of what is happening right now in Nundah is very exciting”. “Additionally, the opening of Airport Link effectively means that Nundah is now an inner city suburb, with travel times cut from up to 50 minutes in traffic to as little as 7 minutes, bypassing 28 sets of traffic lights”. Nundah is 7 minutes from Brisbane Airport and will experience strong demand for rental accomodation thanks to high employment growth at Brisbane Airport, he said. According to Urbis, Each year it is expected that jobs at Brisbane Airport will grow by 6.2% annually expanding to 50,000 workers by 2029. In May, BAC released its development masterplan which sets out a plan to dramatically change the face of the airport by pumping $2.9 billion dollars into new offices, hotels, retail and leisure facilities over the next ten years. Circa Dos Apartments has a display centre located on the corner of Aspinall and Station Streets, Nundah.